While programs like Blackboard, Moodle and CourseWork are serving the needs of universities to be able to deliver online course material, we’re finding that professors, business organizations and non-profits alike are looking for something customizable that integrates with a Content Management System (CMS). WordPress is a popular CMS being used to run about 20% of the internet these days. And that percentage keeps growing. Since people are familiar with the interface, it makes sense to offer the education industry a learning management system (or “course management software”) of some kind to the large WordPress user base. We were very impressed with the offerings out there so far, and applaud the plugin developers working to make education easily accessible through a platform that advocates free-for-all publishing through the web. It’s the perfect marriage: freedom of voice and freedom of education. 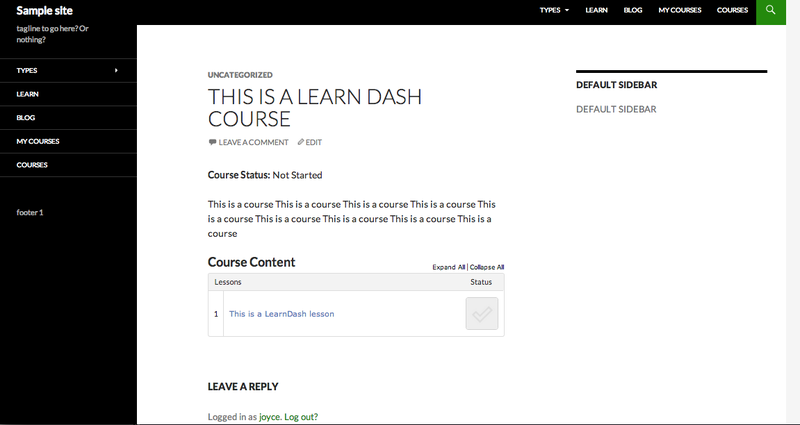 Today we’re going to cover LearnDash, after having tested the plugin and interviewed its developer, Justin Ferriman. Biggest marketplace advantage: This plugin has more features than its competitors mentioned in this article. It is also built by a person who has a background in the e-learning space, which explains why it is so feature-rich and suitable for a wide variety of educational needs. This plugin also integrates the most seamlessly with any theme because it mostly uses Custom Post Types to display content. It also has an extensive list of integrations it offers, all of which are free. These range from e-commerce to membership plugins, badge features and other developer tools such as those that help with Tin-Can API reporting. Summary: Though it launched later than WP Courseware and Sensei, this plugin seems to have advanced its list of features and functionality. I was amazed when I first saw how much it could do. However, with more functionality comes the very difficult task of designing the user interface and learnability of a software, which is where this plugin’s weak point lies (but Justin told me, they’re working on it). These are logos shown on the LearnDash website. 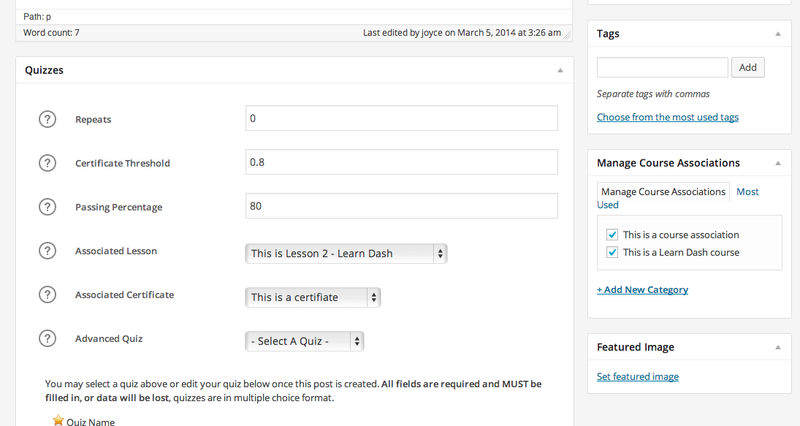 In LearnDash you have 4 separate Custom Post Types: Courses, Lessons, Quizzes and Certificates. 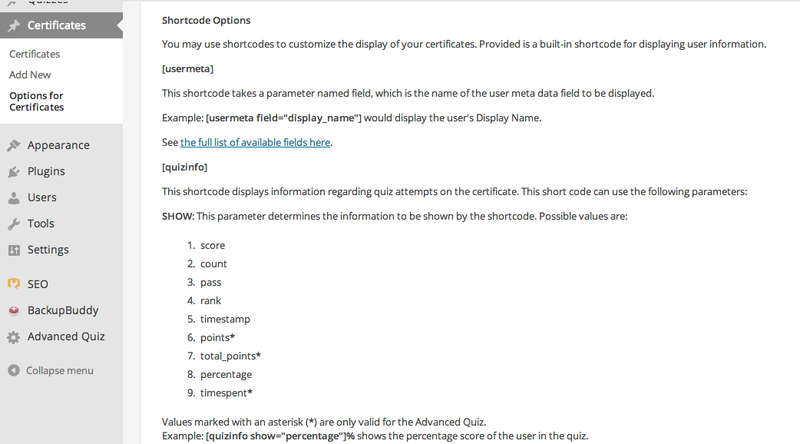 In addition to the above, you also have an “Advanced Quiz” area, which is separated from its plugin counterparts and shown at the bottom of the WordPress dashboard. Since the plugin uses Custom Post Types, the editing area for entering Course and Lesson content looks exactly like the regular WordPress editing screen, with almost all the same controls, including Featured Image. Lessons can have timers, or the option to be visible a certain number of days after a user signs up. They can also accept assignment uploads. This plugin allows a Lesson to be set as a “sample” so people can try a few before committing to buy the entire Course. Lessons can be forced to be taken in a certain order, or be taken randomly. Courses can have prerequisites, can be free or paid and can be based on recurring or one-time payments. 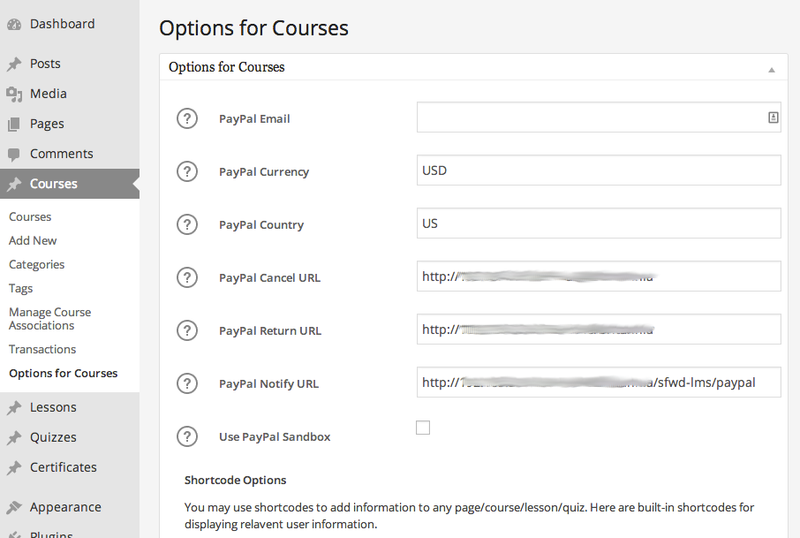 (Paypal integration is automatically set up with this plugin to allow for payment options with Courses). 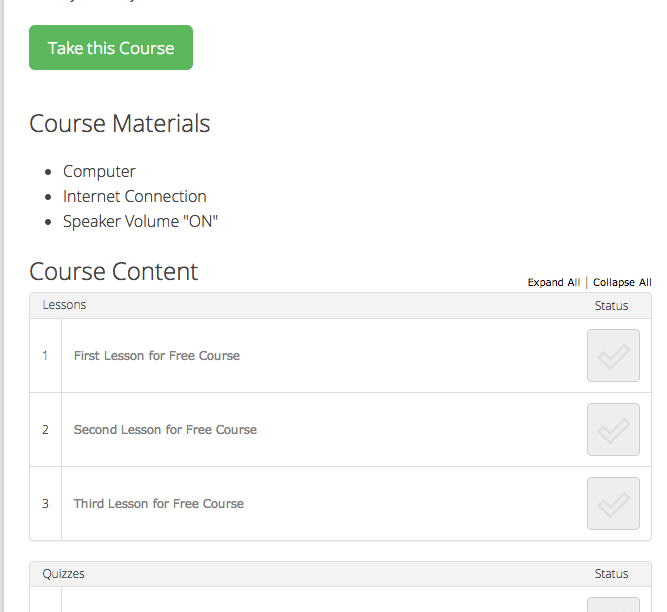 Courses have a “Course Materials” field to enter items that users will need to take the course (such as pre-purchased books, computer or software requirements, and so on). 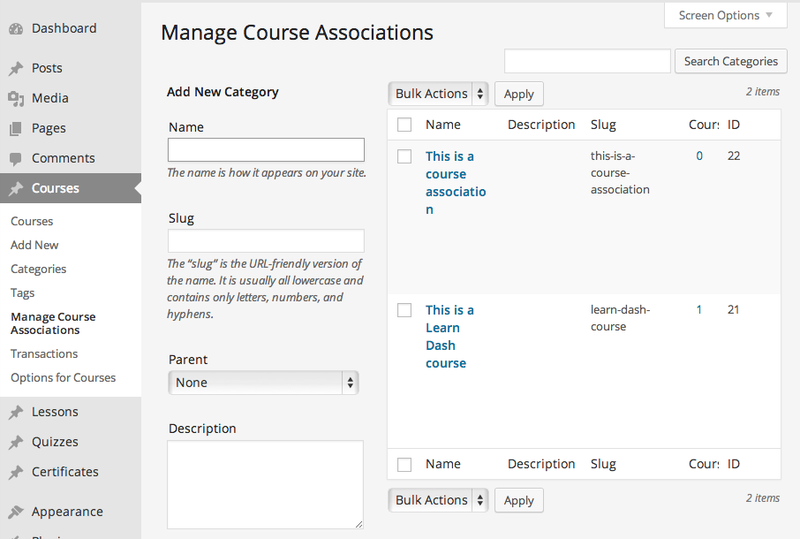 Courses and Lessons can have “Associations,” or regular categories and tags for organization. This is very confusing at first because Course titles automatically become Course Associations and the purpose of the additional Associations taxonomy is not that clear. However, as Justin, the creator explained to me, using Associations will make sure a Lesson is part of a particular Course (or more than one Course), and likewise with Quizzes. The categories and tags are for helping you organize the display of the Course listings on the front end of your website, much like using Post categories and tags. 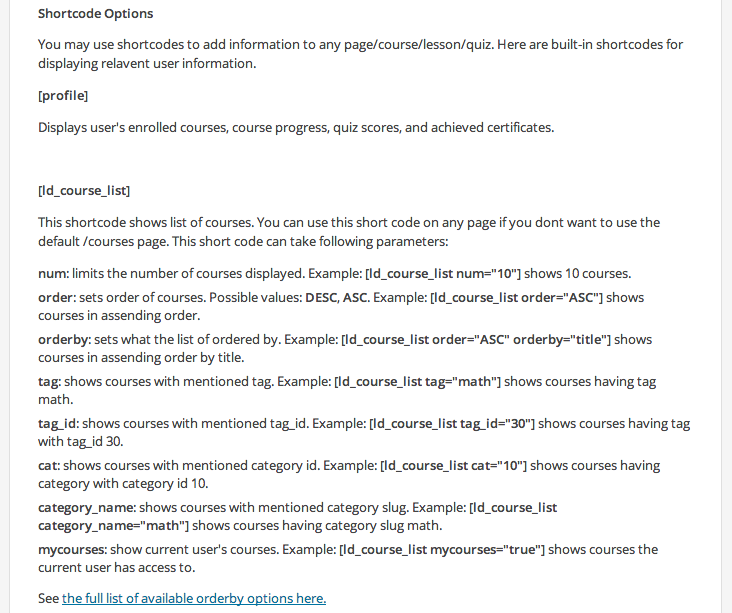 Shortcodes can be used to display Course categories or tags. Shortcodes can also be used to show a list of quizzes, payment buttons, groups, or ‘visitor’ content for those not yet enrolled in the course, plus more. Just some of the shortcodes available in the Options screen. 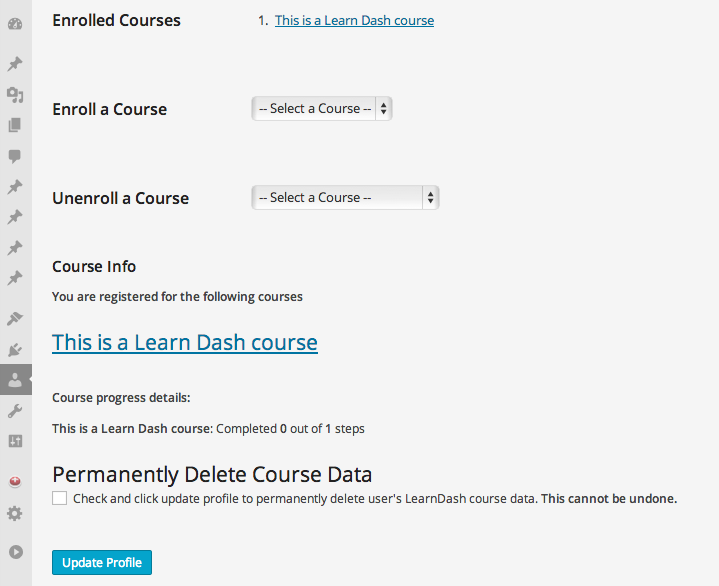 Users can be manually added or removed from a course using the regular WordPress Users menu, since all students are basically ‘Subscribers’ with LearnDash. They can also be part of a “Group,” for which there is a custom user role called Group Leader. This user role allows a teacher to review the scores and progress of students in their Group. 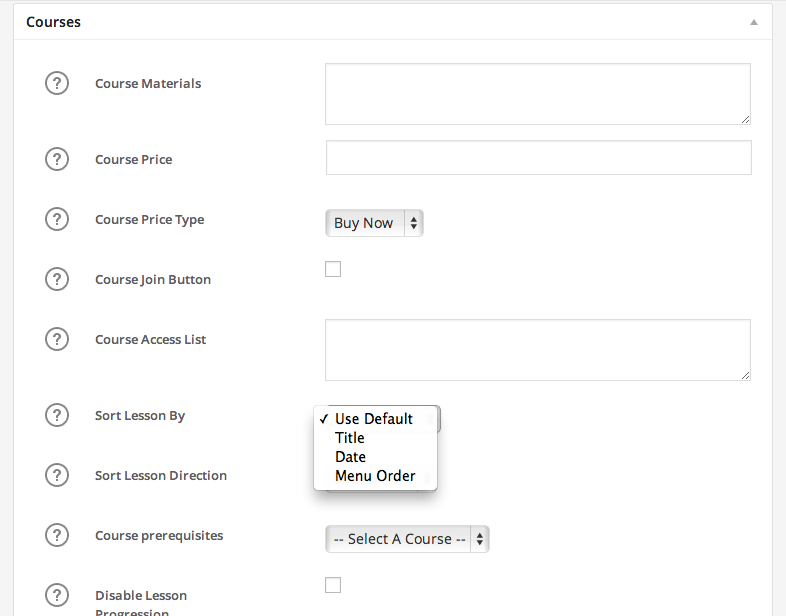 You can bulk add or remove users to a Course. There are two types of Quizzes in LearnDash: the ‘simple’ Quiz, or the Advanced Quiz. Both are separate menu items. Learning the difference between the two, or the reason why two of them exist is very confusing. The Advanced Quiz has a lot of functionality and settings options. 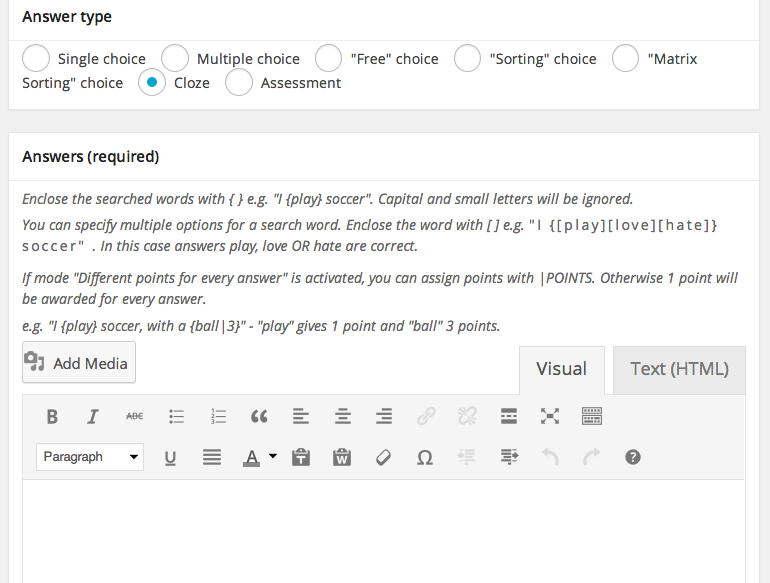 However it is very difficult to intuitively figure out how to create and use an Advanced Quiz, get it to display on the front end of WordPress, or connect it to a Course or Lesson. However, a little nudging through the interface will get you through the hurdles soon enough, and when it does, you’ll have lots of options. Quiz questions use an editing box that is similar to the Post and Page editor, where you can enter formatted text, links, images and other files. Questions in Quizzes can require the following types of answers: Single choice, Multiple choice, “Free” choice, Sorting choice, Matrix Sorting choice, Cloze or Assessment. Although they have confusing names and are even more confusing to set up, they are actually common question types that we are used to. For example “Cloze” questions are basically fill-in-the-blank questions (except explained in a more complicated way). 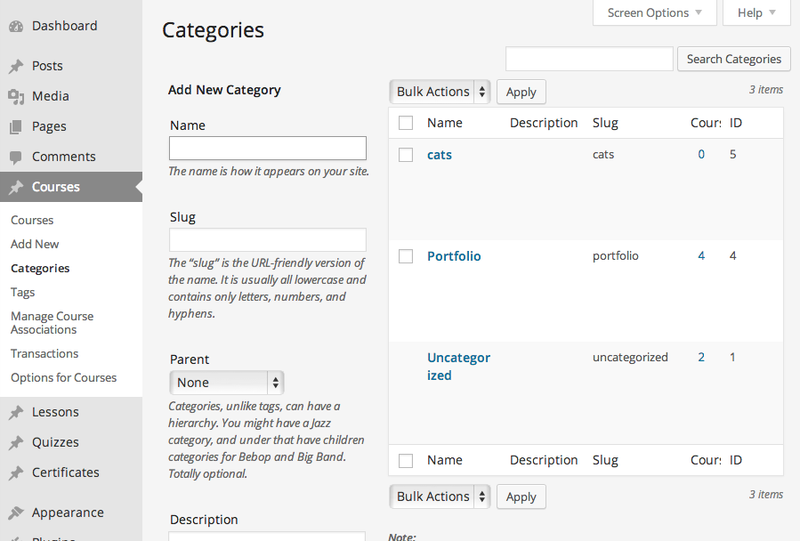 The most unique question offering in this plugin is the sorting option, which asks users to match up words or pictures, or put them in the correct order. 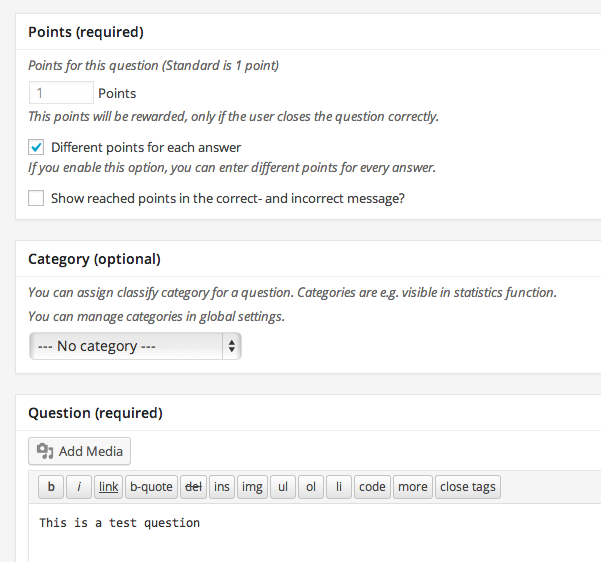 Quizzes can have intro text (such as instructions) as well text to be displayed after results are shown. You can set the number of times a Quiz can be repeated. Advanced Quizzes can opt to have a “Restart” link and or be set to only allow one take. 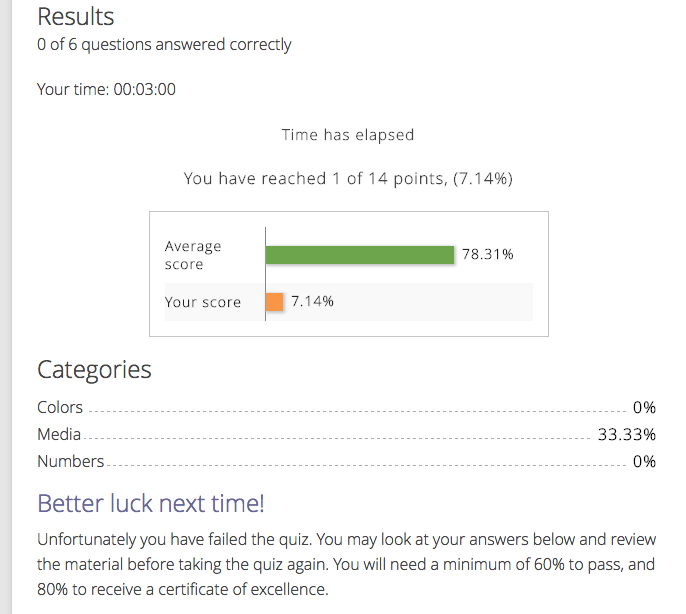 Quizzes have knowledge levels, which rate a user on a scale of 1 to 5 (such as being able to say they are an “Expert” level learner, though this is not part of the passing mark. 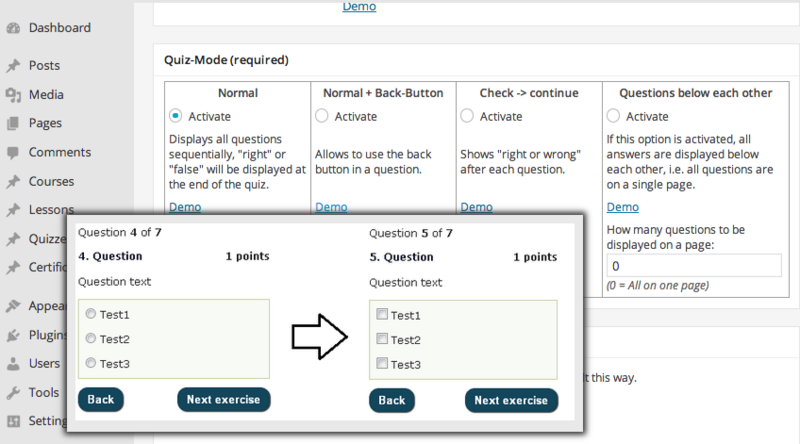 Questions and answers within questions can be moved up or down to change their order using simple buttons or a drag and drop feature in the Advanced Quiz area. Advanced Quizzes can have time limits and can start automatically when a page loads. 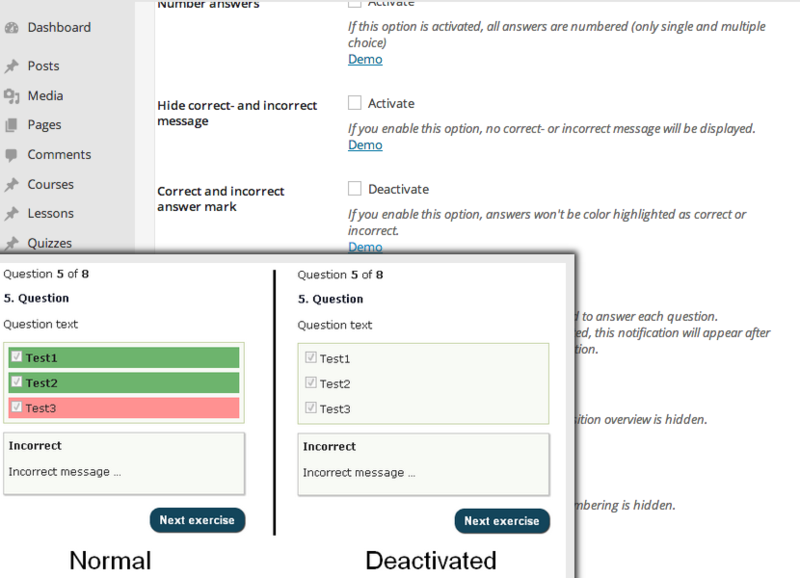 Advanced Quizzes can have overview areas that show a user how many questions they’ve seen, answered and have left to go. It also allows skipping a question and coming back to it later. Quizzes can have both random questions and random answers. This means the correct answer can be option “B” in one user’s Quiz, while being option “A” in another user’s Quiz. In addition, the Quiz can show only a certain number of random questions from a set, to help randomize Quizzes for each user even more. Questions can have a number of points assigned to them. This is great for teachers who want to assign more weight to one question over another. Not only that, each answer can have different points assigned to it, so with multiple choice, the ‘best’ answer can have more points, but a ‘good’ answer can have less, still allowing credit for effort. There are options to either show or not show a user if they got a question correct, or show the correct answer. You can also opt to either show or not show a user how they did overall. You can give a user a message or explanation after getting an answer correct or incorrect. 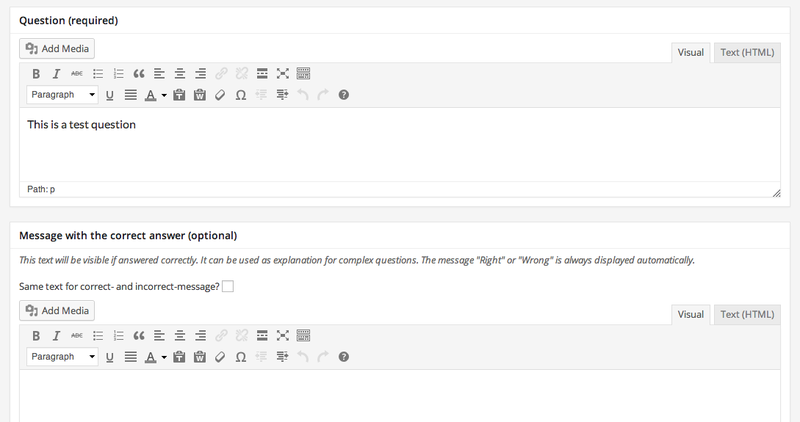 Questions can have “hints” which use a regular WordPress-type editor with all formatting capabilities. 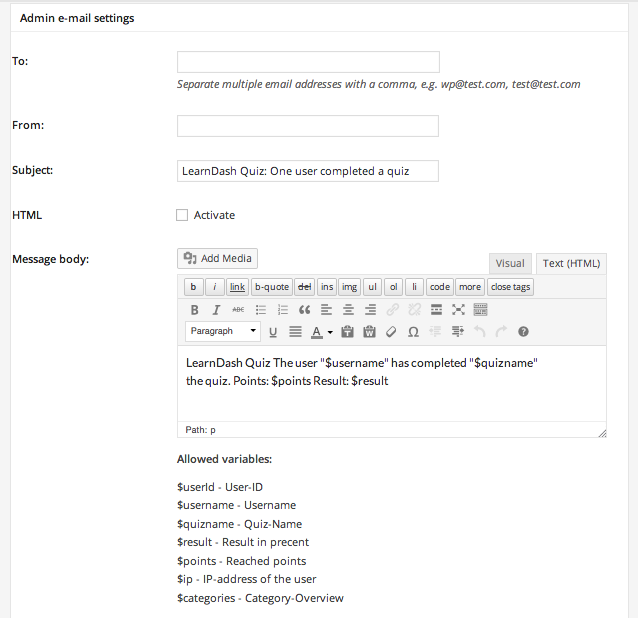 Advanced Quizzes can optionally have e-mails sent automatically to users with results. You can show statistics and average marks to users. There is a Leaderboard option where students can publicly display their scores. 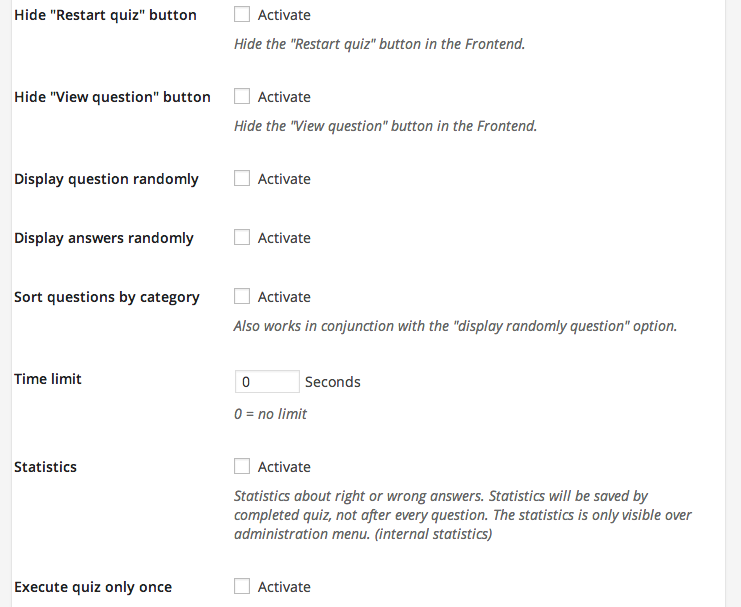 The back end Statistics and Leaderboard area can sort through users to see their performance on a Quiz. There are options to require users fill in a form with information before beginning a quiz (this is useful for entering things like student ID numbers at universities, or allowing the teacher to see the phone number, name and e-mail address right on the Quiz at a glance, like on traditional tests). 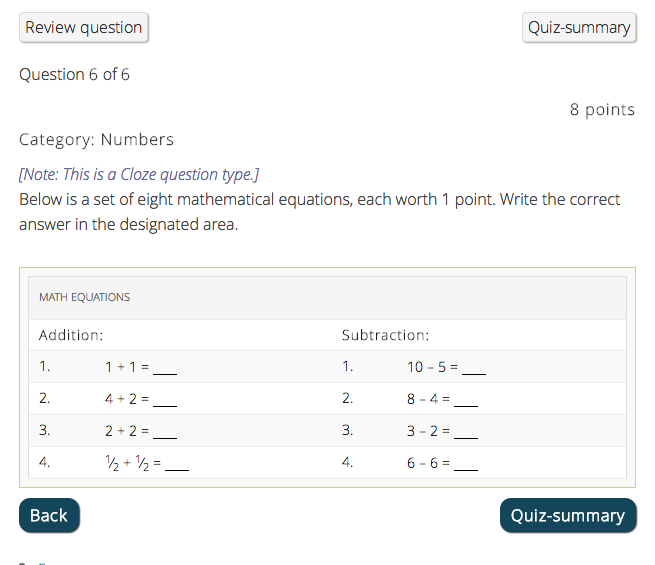 Advanced Quizzes and Questions can be templated for easy reproduction (see above screenshot). Questions can be copied from other Quizzes. 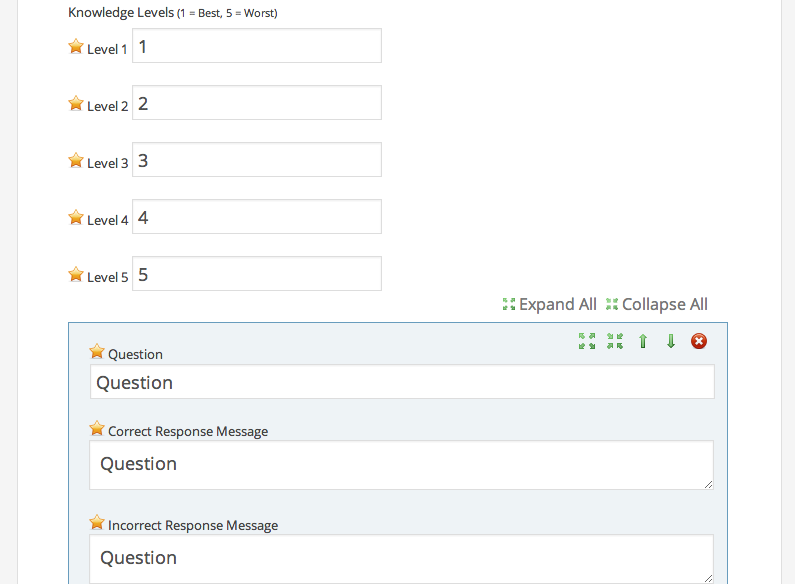 Advanced Quizzes can be inserted into any Page or Post using a shortcode or by using a dropdown option in the “Quizzes” Custom Post Type. Each Course can have different certificates designed for it. A Quiz can be associated with a specific Certificate. 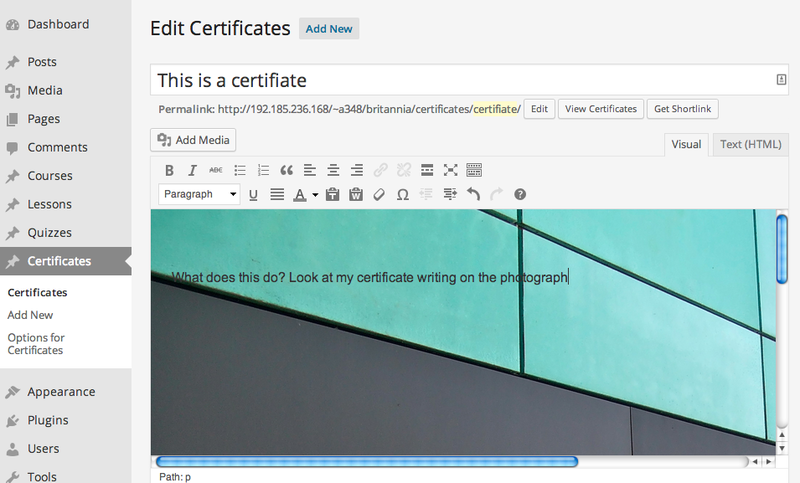 The way Certificates are added is through the Featured Image function in WordPress. 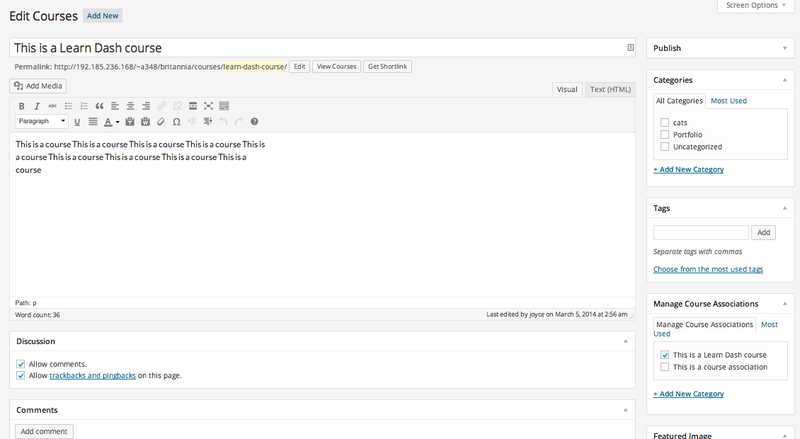 From there you can enter text into the text editor, where the Featured Image is shown as a background. This can get tricky for ensuring proper alignment. Certificates are available for download after completing a Quiz, or in a user’s profile page. There are very little development needs with this plugin when it comes to displaying content on the front end of an existing WordPress website. The way it’s set up makes it extremely easy to fit into any theme, because its contents are contained within the theme’s ‘regular’ templates by using Custom Post Types. In some cases it is useful to know how to use shortcodes, or how to customize CSS to override default styles the plugin uses. The plugin has an extensive list of shortcode options and variations to control the display of customized content very easily. There is no way for a user to upload a file as part of a Quiz question. This can be problematic for accepting essays or other types of long-form answers. Creating some types of questions in the Advanced Quiz area can be difficult if you are not used to coding or logic (see above screenshots). Sometimes there are so many features it is overwhelming to go through the set up of a Quiz. However, this is mainly a user interface problem that can be solved, since a difficult learning curve only needs to happen once. At present, Post categories and tags automatically become Course categories and tags, which can make it difficult to differentiate your blog content from your Course content, or at least keep them separate for organizational purposes (see above screenshot). The Certificates function is a bit awkward to work with (see above). As mentioned above, the user interface and learning curve is the hardest part to deal with when using this plugin. I personally feel like we’re approaching an era much like five years ago when we scratched our heads and said, “why is it so hard to do really good e-commerce with WordPress?” A few years later, the WordPress community began providing some of the most powerful e-commerce solutions available on the web. 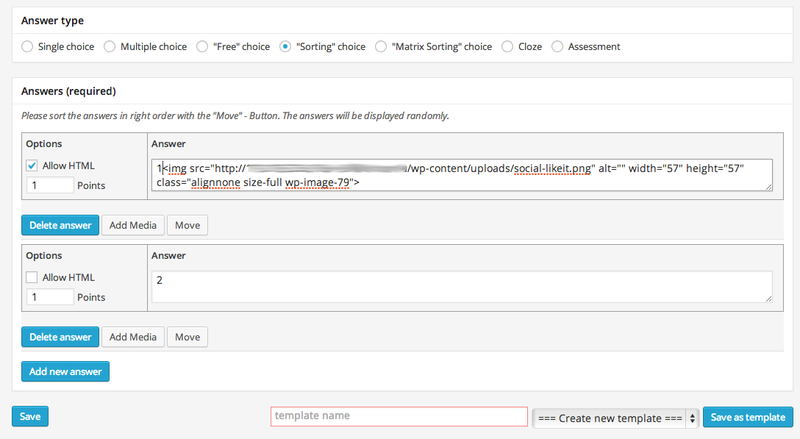 The same seems to be happening with Learning Management System plugins for WordPress. Though we are in the beginning stages, as you can see. Each plugin described in this article still has some growing to do, and each is developing strengths in its own way. Sensei is going to be most attractive for houses looking to sell course content, WP Courseware is going to be the easiest to manage for lots of learning content in school systems, and Train-up is going to be the optimal solution for training employees at work. We are in the process of looking at Learndash and Ontraport, however I have not been able to find much on these two integrating happily. Do you have any advice here? Do they talk to each other or are there additional plug-ins and work arounds required to make these two systems work well together? Thanks! We are trying to integrate Ontraport and Learndash using Pilot Press, but OP overrides many of the cool LD features and they don’t talk well to each other. We’ve considered having people register through LD and then push to OP, but we loose some cool features we developed over at OP. Is anyone else working with these two? I think we need to develop an upgraded plugin for the 2 to talk correctly. Hi, as far as leandash is concerned, it has the shortest learning curve. But there are some suggestions, propanel is a good addition but it should have capability to be displayed on a front end for privileged users instead of backend. I had the requirement last week, and it took me a lot of time to bring it out of the dashboard. Thank you for this excellent blog post. I look forward to seeing the new updates Justin! Lastly you updated about UI! Thanks! Not being unfamiliar with several LMS platforms, your article definitely steered me away from LearnDash. If I’m going to use something that’s this ungainly (strikes me as being like Topsy – “I just growed”), I’d be better off just sticking with Moodle. I’m not sure how you got such a negative impression of LearnDash from this article, but that’s not what it was meant to convey. I was actually quite impressed with the plugin’s capabilities. It is quite a powerful system with a lot of options. It also comes from a background of a person who has worked in the industry quite a bit and who seems to understand the nature of organizational needs as far as an LMS goes. The only difficult point with their system was that as of a year ago now, they probably needed to work on their UX and learnability. That is something that, while not simplistic to solve, is also not impossible to solve with some effort. Justin did realize that when I interviewed him and also posted a comment here below that he planned an overhaul of the UI of their system. I also clearly outlined that there are two other LMS WordPress plugins in this series, which you may want to look into if you are considering a self-hosted option to work within WordPress apart from Moodle. In my estimation, I don’t think your options should be LearnDash or Moodle, and that’s it. There is actually a lot more out there, even resources I have not mentioned in this series. LearnDash, as well as many other premium plugin companies, are also constantly making updates to their software. This article is maybe a year old now, so I imagine LearnDash could be drastically different by this time. To really get into the details of it, I would definitely check out their site and also check out the other LMS plugins and their reviews. Joyce, awesome series! Thank you. I’m creating a new course for writers and previously have used WPC and loved it. However, I’m about to start using Ontraport, and since it’s a membership CRM, WPC doesn’t play well with it apparently. I wish I could just flick a switch and turn off their membership aspect and deliver my courses using it! It’s very easy to use, and quick learning curve. And it’s gorgeous for the user. Other than the membership issue, I love it. HI Katie, I would try mentioning this to the plugin authors. I happen to know from speaking with the owners of some that they do listen intently to suggestions like this. WP Courseware for example does get a lot of their development ideas from their user base. So speaking up about this does go a long way. Don’t feel that your email or comment might get lost in a sea of other messages. You’d be amazed how much gets listened to, even if practically speaking, priorities have to be set in order and some ideas just need to be pushed down the line in terms of development timelines. I’ve spoken to the lovely people at WP Courseware a number of times but their plugin doesn’t really seem tailored for growth in business. I’ve been using their software for 2 years now and my business has grown to over 1000 users, so we’re constantly struggling with WP Courseware because it doesn’t integrate with a proper CRM – it’s all hacky patchwork stuff. The FlyPlugins team admit that their plugin isn’t geared to work with any of the big CRMs and you can’t even hire a developer to take care of it for you because it doesn’t have an open API. I look forward to moving over to a big CRM and integrating with Moodle, if it works. Thank you for your feedback, Loz. We’re hoping to provide API access in the near future for better development customization. Initially, we found that most of our users preferred to choose a plugin for each functionality set (LMS, e-commerce, membership, etc.). That being the case, we’ve focused our resources on developing free integrations which will link WP Courseware with a secondary WordPress plugin solution which fits the user’s needs best. But as we’ve grown we’ve had a number of requests for direct integration with larger CRM solutions which can certainly extend the scalability and reporting for large-scale users. And of course, if you ever need assistance with any of the integrations please don’t hesitate to reach out to us. I just bought LearnDash with ProPanel a few days ago. It is not easy. The Propanel plugin doesn’t work at all! If I knew a WordPress extension was going to be difficult I would have stuck with Drupal Opigno. I’m shocked that a Commercial plugin has such weak documentation. I wouldn’t recommend this extension to anyone. Just bought LearnDash few weeks back to power Doctors CMEs online and truly Joyce, the learning curve is steeper and I have not even started creating quizzes, allowing assignment and creating certificates, still on getting the shortcodes to work on my divi front end and the ability to make easy navigation of courses, lessons and topics created seems to elude me at the moment. But to make it better for users, Justin need to create full videos how to use the full modules with extension for a type of learning maybe for Doctors CMEs, University or Law-firm or a mummy blogger (online training materials) to give us a better idea how to go about setting it professionally than the short videos provided explaining each modules in bits that doesn’t sum up the whole process easily for a particular elearning. Thanks for the wonderful review, cheers. Thanks for the comment. I found your support request regarding the shortcode and divi theme. One of our users replied with a pretty useful response in there for how he is using shortcodes with this theme (in case you haven’t seen it yet). If you still have questions though, we are happy to continue to assist on the support site. Interesting idea about creating “niche-specific” tutorials for LearnDash users. It may be something we can investigate further. We would need to do a bit more research as to which niches would make the most sense. As you may have gathered from the forums, the use-cases for LearnDash are rather broad, which isn’t too surprising actually as a learning program is never exactly the same for each person. Because of this, we provide documentation that is more in regard to basic processes, and then answer specific use-case questions via the forums and help desk. Thanks for providing your feedback as it is useful in helping us evolve our offering. If you have any additional questions regarding getting your learning site set-up, we are happy to provide further assistance. Thank you very much Justin for your deep reply. I’ve actually surmounted the part of creating courses, lessons and topics and getting the shortcodes to work on Divi front-end though the course_list shortcode styling is off but LearnDash is just working smoothly. I still maintained as regards creating niche-specific LMS training for users will not only make LD easy to grab but will fast-track the time spent to creating professional LMS and also reduce your time spent on support hence, creating more time to add features (from community ideas) which invariably will increase your customer base faster than ever. Like now, there is a feature that is vital to Doctor’s CME online and that is credit/unit points of study course (normal to school learning) which I know that LearnDash doesn’t have now but if requested may take time because there are many users asking for how to set up a basic LMS using LD…something that ought to have been solved with an educational process guide sample tutorial. Thanks for creating this charming solution. Cheers. Thanks for the shoutout Joyce!! Awesome article and resource too, enjoyed reading it! Hi Dan, thanks for the compliment! Your article helped during my research, so thank YOU! Thank you for this excellent blog post. I look forward to seeing the updates Justin. Thank you for the extensive review. I have been keeping an eye on LearnDash for a while since I am a WordPress fanboy and also an instructional designer for a college whose online credit enrollments are >60%. The one thing that concerns me about the design decisions in LearnDash is the emphasis on quizzing. Generally, we here in our ivory tower instructional science see quizzing as a poor strategy for learning, such as reinforcing incorrect answers, and relying heavily on rote memorization as demonstration of learning. Quizzing is good for self-checking, but that’s about it. We deliberately discourage our online instructors from using it. Instead, I wish there was more consideration to use the power of social interaction in WP to support sensemaking and sensegiving. These are strategies that take the collective experiences of others who have completed certain steps, tasks, or objectives and uses them as a way to aid others who have reached a stopping point along a similar narrative of cognitive movement. This approach is derived from the research done by Dr. Brenda Dervin called the Sensemaking Methodology. 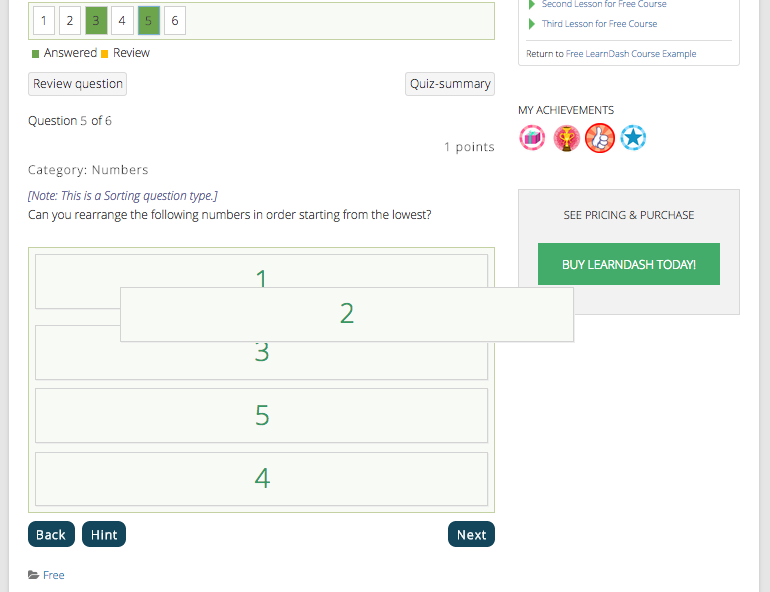 Assembling quizzes is already a commodity in the LMS space, and offering this kind of feature is not so much innovative as it is a nod to the standard (somewhat outdated) notions of what learning is about. Everyone does it, but it doesn’t lead to deeper understanding of subject matter. I feel this is another example of taking a new technology and filling it with the old technology’s content. I wish someone were more forward thinking about designing an LMS utilizing the power of social knowledge. Hi Steve, thanks for your input. It’s really valuable to know this. I agree that is one area I noticed none of the LMS plugins that I discovered were focused on. However, many of them have integrations with other tools and external plugins that could do something close to what you’re hoping for. 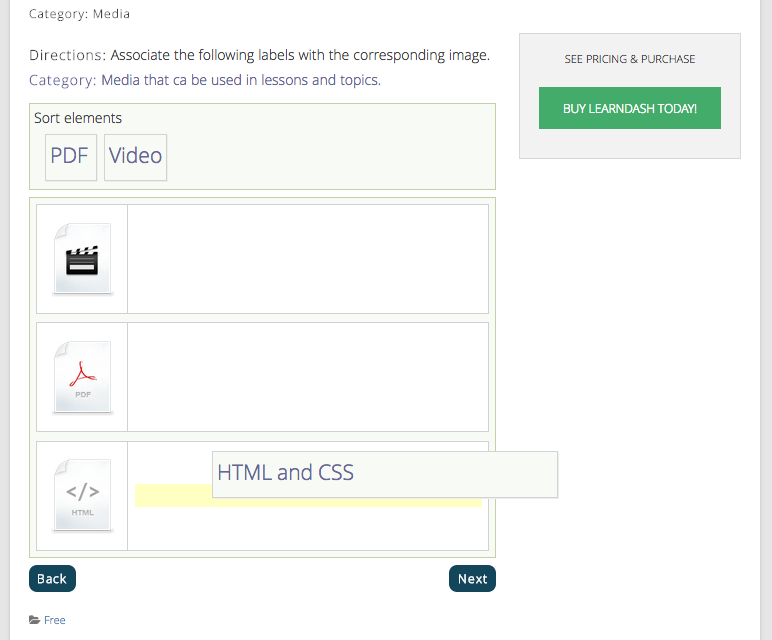 For example, LearnDash and WP Courseware can integrate with membership plugins. I did see that up on the list of ‘things to do’ for Sensei is to integrate with a forum plugin like BuddyPress or otherwise (there’s more than one option). Of course in that case, it’s not an online-only education process. But think of things like Google Hangouts (which, yes, can drain your computer…mine freezes a lot when using it), or Skype or GoToMeeting. I’m sure there must be other tools out there that are geared towards educational purposes. But I think you’re on to something, and I also do hope the WordPress LMS plugin creators will catch on to this and provide a way for more interaction among learners and educators in a course. I agree with Steve that quizzing isn’t a great strategy from an instructional design perspective. Just as important, I sense there’s much less of a business need for the quizzing feature within a WP LMS than there is with an enterprise LMS. As I understand it, WP is found mostly on small-to-medium business sites, which are the type that are probably selling their content, rather than using for large in-house training. For those of us who are selling our courses/workshops on-line, presumably the person came to our site because they wanted to learn (why else would they shell out their own money? ), which makes quizzing a waste of their time. I’m not saying it has no purpose, but I wish there were more LMS options in WP that had a really strong e-commerce and marketing elements (sell, sell, sell!). First let me congratulate you on a fantastic blog series. Not just this post, but the previous two related to learning management plugins. I am sure that they will prove to be a useful resource. The areas for opportunity for LearnDash that you pointed out are well articulated. I’m excited to share that our next update involves a complete overhaul of the UI. Beta testing so far has yielded positive feedback, and I would estimate we aren’t too far off from the release. In fact, some of the suggestions that you mentioned during our conversations will be implemented, so thank you for your feedback. We are passionate about elearning and where this industry is headed, and it’s nice to be able to give back and share our industry experience with others. I think people are just now seeing what is possible with WordPress in this area. Thanks Justin! Glad to hear about the update and do let us know on this post when that is released! I’m sure it will be useful to the viewers who find this article. Just posting that the new version with the UI updates has been released.